Notes: This was the third film from director Robert Zemeckis in which he used his motion capture process to animate in 3D, following The Polar Express and Beowulf and preceding Mars Needs Moms, which flopped so painfully that his animation study was shut down. Although a fairly straightforward retelling of the story, he employs a lot of the motion capture tricks he’d used in previous films, such as using the same actor to play different characters opposite himself or at various ages. Jim Carrey, for example, plays Scrooge at every stage of his life, as well as all three of the Ghosts, using the logic that the ghosts are extensions of Scrooge’s own soul. Okay, I can buy that. 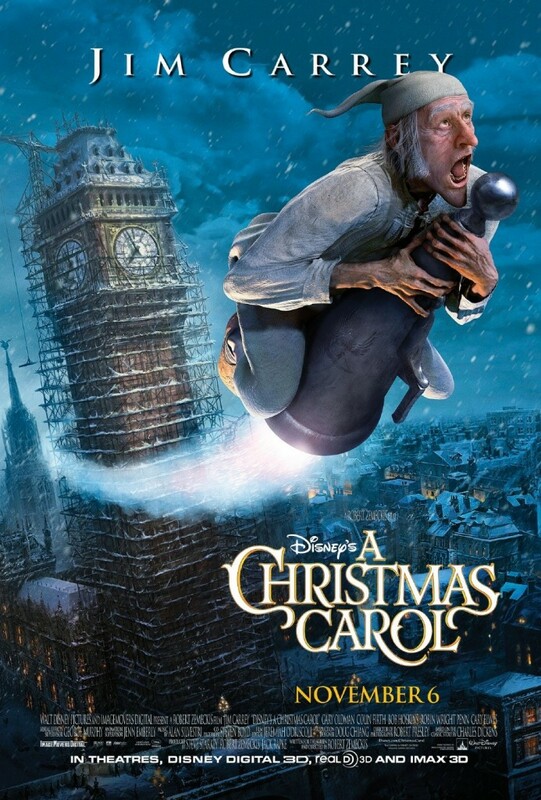 Gary Oldman, meanwhile, plays both Bob Cratchit and Tiny Tim and – for some reason – Marley, while Robin Wright plays both Scrooge’s sister Fan and the love of his life, Belle, which has some disturbingly Freudian implications. Thoughts: Once there was a little boy named Robert Zemeckis. Robert made great movies in a far-off land called the 1980s, but as the 21st century began, he fell in love with a pretty girl named “Motion Capture CGI.” They had four children together before they broke up, and of the four, this is probably the best. Part of it, let’s be honest, is the source material. A Christmas Carol is by far more classic than Zemeickis’s first or last motion capture films, and while Beowulf is a classic in its own right, he took too many liberties with that one (Grendel’s mom is hot? That’s sick.) for it to really rank. Here, though, he takes a legendary tale and gives it a pretty decent polish that makes it worth revisiting at this time of year. One of the interesting things that Zemeickis pulls off is creating characters recognizable as the actors that play them while still giving them enough of a twist to work as animated figures. Carrey is clearly visible inside Scrooge, but his elongated nose and chin would look silly in real life. Gary Oldman can be squished down to play a short little Bob Cratchit, Colin Firth can be puffed up a bit so Fred looks comfortably plump. Carrey can also be seen in each of the three ghosts. It’s an odd choice, to have him portray the three of them, and I’m not entirely convinced of the point Zemeckis was trying to make, but Carrey’s performances as the ghosts are just fine. Christmas Past is light and airy, Christmas Present is enormous and bombastic. Christmas Yet to Come… well, he’s barely there, and that’s a good thing. This version is also a good bit scarier than many of them, and at the same time, more in keeping with the original Dickens. Marley’s head wrapping – which was actually a tradition at the time to keep a corpse’s mouth from hanging open – comes loose, and his jaw opens up to a horrific degree. As he howls at Scrooge his mouth rattles around like something out of a zombie movie. Christmas Present doesn’t just age, as he often does, he withers away until there’s nothing left but a skeleton, its teeth chattering with maniacal laughter. Then there’s Christmas Yet to Come, who shows up initially just as a shadow – Scrooge’s shadow, in fact, in a warped and twisted form. We don’t really see much of a physical form for him at all, in fact, which is terribly effective. This is about as scary a version of A Christmas Carol as I’ve ever seen. The scenes with the three ghosts are pretty by-the-book, but done well. In fact, one of the few times where Zemeckis’s love affair with his computer (more on that later) really works is when Scrooge is facing Christmas Present. Rather than teleporting him to the other locations, as he usually does, he turns the floor in Scrooge’s house transparent and we watch as they “fly” from one place to another. The visuals here – throughout the Christmas Present sequence, really – are absolutely top-notch, and are an example of what Zemeckis can do with his CGI at its best. There are a lot of good things about this movie, but Robert Zemeckis brings the same problems to this as he did with all of his motion-capture films. First, and most problematic, the characters are largely expressionless. He can make a character move like a human, but he hasn’t mastered the skill of putting feeling into their eyes, which makes them seem somewhat stiff and lifeless. It’s the classic Uncanny Valley problem writ large. What’s more, Zemeckis was so in love with the technology that he often did things just because it was possible that didn’t really add anything to the story. There’s an extended sequence where Scrooge – for absolutely no reason – is shrunk to the size of a mouse and whips around London. It reminds me of the scene from The Polar Express in which a train ticket is taken by the wind and blown around. It looks good, but ultimately, it’s a meaningless scene that doesn’t go anywhere or do anything. In both instances, I felt like I was watching the film of one of those motion simulator amusement park rides, which is pretty dull when you’re in a stationary seat. Zemeckis does similar things several times throughout the film, to the point where it starts to get actually obnoxious when you sense the first few seconds of the next such sequence. It’s actually a shame that he never quite got a handle on how best to use this sort of technology, because when it works it works well. But like George Lucas dropping in added effects to the Star Wars special editions, Zemeckis got so excited that he could do certain things that he never stopped to think about whether they should be done. The result is like going to an industrial sawmill to cut a single two-by-four in half. It’ll work, but it’s overkill, and there are much better ways to do the same thing. Posted on December 24, 2013, in 4-Icons, Fantasy and tagged 2009, A Christmas Carol, Animation, Bob Hoskins, Cary Elwes, CGI, Charles Dickens, Christmas, Colin Firth, Daryl Sabara, Disney, Ebenezer Scrooge, Fay Masterson, Fionnula Flanagan, Gary Oldman, Jim Carrey, Molly Quinn, Robert Zemeckis, Robin Wright. Bookmark the permalink. Leave a comment.